The Toyota 86 can seat four people comfortable. You can upgrade the upholstery with leather and sport colors as well. The standard features in the 86 includes Bluetooth, USB ports, eight-speaker stereo, voice commands, and 4-inch touch screen. The rearview camera is especially helpful for backups and parking as well. The driver assistance features like blind spot monitoring and departure lane assist can be added on as well. The infotainment system works well for smartphone integration and apps, as well as voice-activated control. 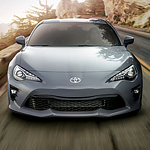 You can test drive the all new 86 when you visit Hixson Toyota.